Benzoyl Peroxide Lotion (5%) or (10%). Water (Aqua), Propylene Glycol, Glycerin, Sorbitol, Carbomer, Sodium Hydroxide, Diazolidinyl Urea, Propylparaben, Methylparaben, Disodium EDTA. I ´m 34 and have had cystic acne for years.... In the last year it got significantly worse as I now live in a warmer more humid climate. I have tried EVERYTHING and nothing has worked. 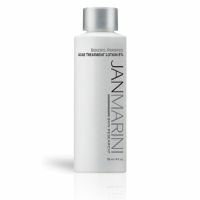 My sister has been raving about Jan Marini ´s retinol cream so I thought I might give this brand a go... I did some research on their web site and found a cream the is called Age intervention DUALITY, adult acne treatment cream. I tried adding that product here but it didn ´t work so sorry about this review being under a similar product. Anyway, this cream has miraculously treated my angry cystic acne within days! I never post anything online but felt I wanted to share this so other people can be helped too. Initially it made my skin very dry but after peeling and using the cream in combination with a moisturizer the dryness is now gone. The cream contains retinol and benzoyl, two very very helpful new friends. Fast results. It actually works!! Very drying, but I feel like my skin has adjusted after a few days and my skin isn't as dry as it was after I first used it. I've had some sort of reaction to Step 3, which I've replaced with a different SPF. I'm 24 years old and I've had acne for what feels like forever (about 12 years)!!! I treated it initially with Yasmin, the birth control pill, however that only helped to a certain extent. I have the typical 'T-zone' problems, with occasional break outs on my chin but my main concern is the stubborn area on my forehead! It's a congested area of small under the skin pimples that are only noticeable when under direct light and I've tried many things (bicarb soda, clinique, dermalogica, organic products, facials, high frequency machine) with absolutely no result. I've been using the Jan Marini 5% Benzoyl Peroxide Teen line for about a week now, it was recommended to me by a dermatologist, and I've experienced a massive improvement even after 2-3 days! My skins not completely clear yet, but I will continue to use these products because the congestion has significantly reduced and I couldn't be happier. The only downside for me is that it is extremely drying, and I also think I've had some sort of reaction to Step 3 which is an SPF moisturiser. More people should know about this range and try it!! So far it is the only thing that has worked for me. How I wanted acne.org's 2.5% to work for me. Again and again I tried, but whenever I moved away from my otc 10%, the breakouts increased. I followed the regimen to the letter. Then I grew tired of the 10% burning my skin and thought there must be a happy medium. This is it. A thin layer of 5% at night is all it takes for my skin to be happy. I have tried Paula Begoun's 5%, but like so many others, she include laureth-4 and cetearyl alcohol, both rated highly comedogenic. My skin agrees. Thank you Jan Marini for a gentle solution. $25 for 4 ounces is fair.